We know how many things need to get done after you say 'Y E S !' to forever. So we thought we'd make the stationery choosing a little easier for you by putting everything into one neat little package, well actually four. These different packages range from invites & RSVP's only, to the whole invitation stationery sh'bang. If you don't see something here that you like, let us know in the form below. Your options are endless! The Cashmere best employs the 'less is more' policy like no other. But similarly to it's rabbit breed, this package is free to roam and play (design & creativity wise) within their safe boundaries of these papers. *This can be swapped to an additional information card, details card, RSVP card or a wishing well card. If you are wanting a line map, please note that there will be another $100 (exclu. GST) fee. 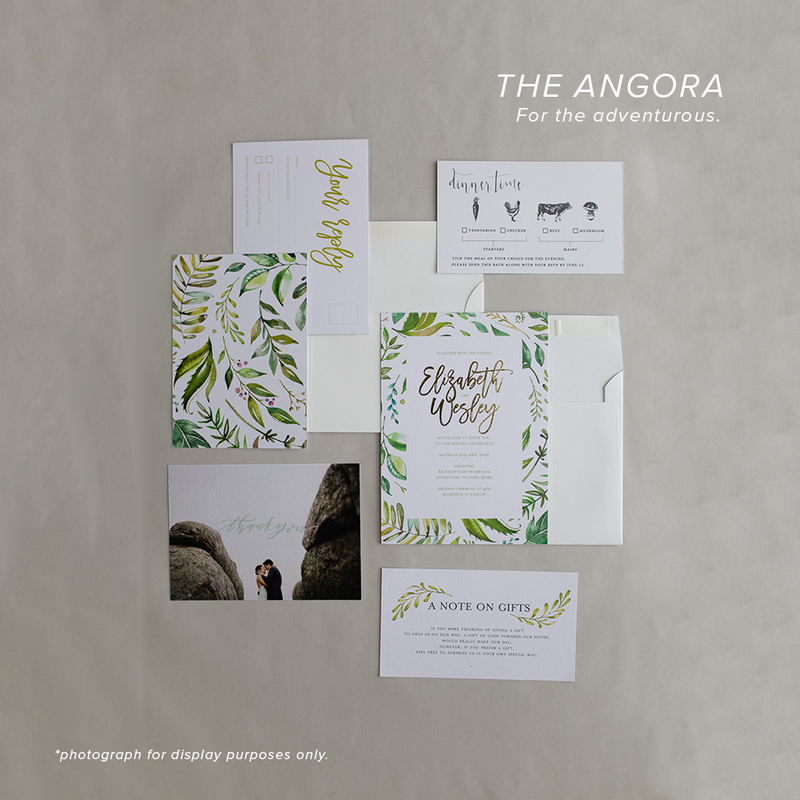 Note: The design of additional stationery items (RSVP, Additional Info, Save the Dates, etc.) will be based off of a chosen invitation design. Did you know the Palomino rabbit is known as one of the friendlier breeds of rabbit? Similarly to the rabbit, this Palomino package was made friends in mind. A little more information can go a long way. It's always all the little elements make an invitation suite stand out amongst all the others. Let your dreams (and information) run wild and overflow onto the cards available here. There is nothing you can't include! *This can be swapped to an additional information card, details card, RSVP card or a wishing well card. Note: The additional stationery items (RSVP, Additional Info, Save the Dates, etc.) will be based off of the chosen invitation design. Similarly to the Angora breed of rabbit, this package can be overwhelming at first. But the reward is so worth the hard work. This was created for the ones who love piecing the little things together for the bigger vision. There are endless possibilities with this beauty. *This can be swapped to an additional information card, details card, RSVP card or a wishing well card. If you are wanting a map, note that there will be another $100 (exclu. GST) fee. If you're unsure, just give us a rough estimate of your quantites.